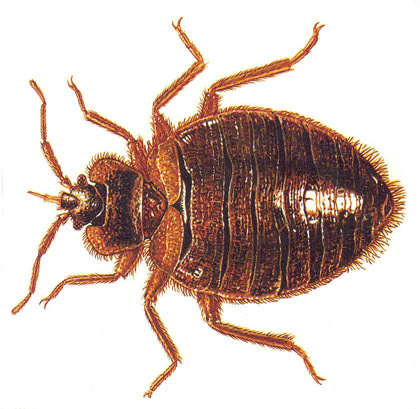 Bed bugs are flattened, oval and wingless. They are often compared to lentils or apple seeds. They appear swollen and reddish after a blood meal. They are nocturnal and live in tight cracks and crevices such as: mattresses, box springs, bed frames, wall voids, dresser drawers, outlet plates, closets and picture frames. They are bloodsuckers and are active at night with peak feeding before sunrise. After feeding for about five minutes, the bed bugs return to their hiding place. Bites are not felt until some minutes or hours later. They can live for a year to eighteen months without feeding but normally try to feed every five to ten days.